Miles and his men set off with the intent of killing Kimblee and his henchmen, something Ed objects to. 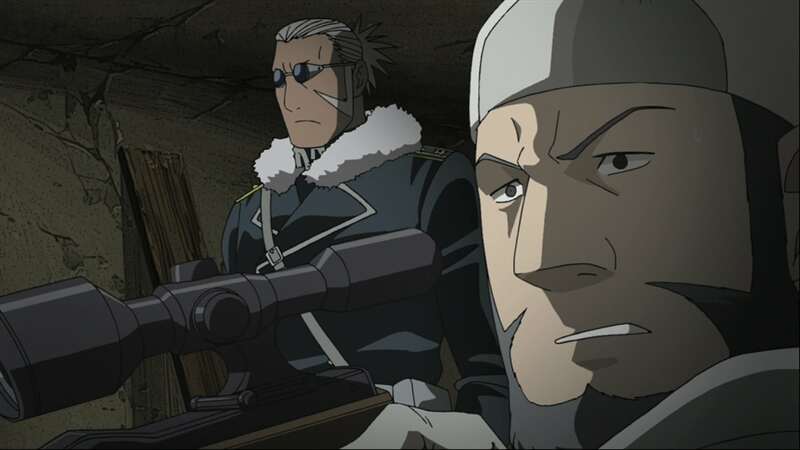 As Scar’s group exits the mine, they find Al, who warns them about Central infiltrating Briggs, so Scar decides to take them towards an Ishbalan slum. Miles’ group attempts to snipe Kimblee, but Kimblee has already figured out their intent and uses a cover of snow to enter the mines. Ed tries to follow, but is attacked by two more chimeras. Ed disables them by using the ammonia in dynamite to make a stink bomb to overwhelm their high sense of smell. 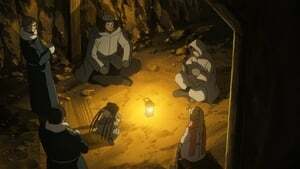 Ed then knocks the Philosopher’s Stone out of Kimblee’s hand, but Kimblee uses another Stone hidden inside his mouth, sending Ed and the chimeras down a mine shaft and leaving Ed impaled by a steel bar. At the same time, Al starts to drift out of consciousness, saying his soul is being drawn back to his body. Determined not to die, Ed gets the chimeras to remove the bar while he sacrifices some of his life span to temporarily fix the wound and to stop the bleeding. The chimeras find the Philosopher’s Stone that Kimblee dropped, and, thankful for their rescue, decide to take Ed to a doctor.